Spiritually Active, Governance Engaged Conservatives (SAGE Cons) are noticing a disturbing trend. Church attendance is plummeting in America. 93% of them realize that fewer people are going to church. In 2010, 52% of adults regularly attended church. What about those who have not attended a church service at all in the last six months (not counting weddings and funerals)? The number as 28% a few years ago. Today, that number has hit 45%! What’s happening in our culture today? 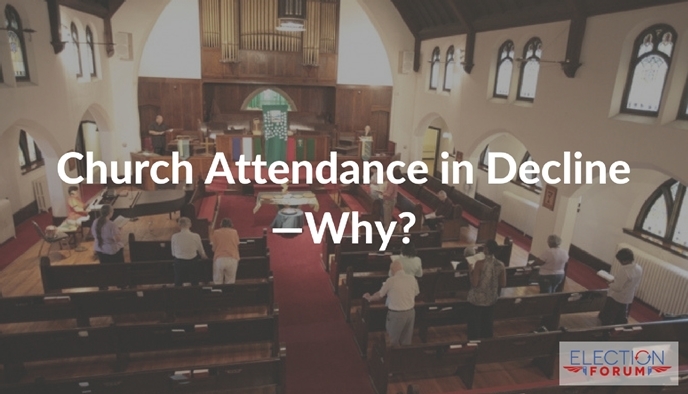 Why are so many people skipping out on church? Our once-thriving church now has an average Sunday attendance of about 20 – mostly older people. Eight to ten attend Bible class before the service starts. We are a friendly, welcoming congregation, but are so sad that more people don’t recognize the importance of regular worship. Our church is one of the most conservative and traditional of the various Lutheran churches, and we have welcomed a few people who have left other religions and other Lutheran variations because of the liberalism of their former churches. What will it take for people to wake up and realize their need for a strong relationship with the Lord and their need to be a part of a loving church group? I believe we need a tent revival. Tents attract people. Billy Graham and Chuck Smith had tent revivals. (The Tabernacle). I went to my Presbyterian Church on Christmas Eve. I was happy waiting for the beautiful good news message…instead…I was lectured about refugees. How Jesus was a refugee, and I was being Harod if I didn’t welcome refugees into our country. I was happy to leave and I will not return. Patricia – see my reply to this article – Traditional Christianity has lost touch with the Truth of the Gospel message and is, IMHO, seeking relevance by leaving God’s Word in the library while they speak to current issues in ways that would appeal *only* to those who in fact do NOT know God’s word. Any read of the Old Testament as well as the new will tell you that God has special judgement waiting for False Prophets and Teachers who say only what their congregations want to hear – Nearly gone are the Finney’s of old – true-hearted pastors who proclaimed God’s word fearlessly – now we’re all about great tweets and social media posts – the sound-bites of this generation. I’m sure there are great pastor/teachers in traditional denominations across the US, but unfortunately, many have abandoned the Truth for a lie, and I fear for their souls. Matt. 24:37 No one knows about that day or hour, not even the angels in heaven, nor the Son, but only the Father. 37 As it was in the days of Noah, so will it be at the coming of the Son of Man. Great passages. Thanks for sharing them. Perhaps, but in case you haven’t heard, attendance at games and especially TV ratings are down with the NFL. Here’s some history and my theory: Loss of what I’ll call the “US Christian Identity.” I was born in the late 50’s. Back then church attendance was viewed as normal, cultural. Folks who did not go somewhere were odd, and likely big “sinners” – so lots of “outer appearance” of Christianity, but not much “reality” with Christ. Then in the late ’60s and into the mid-seventies (and to some degree well beyond), we saw a great revival that focused mostly on youth culture known as the “Jesus Movement” – that grew and progressed with millions turning to Christ and we saw the birth of “Evangelical” churches who were not aligned with traditional Catholic or Protestant denominations. Most of these churches focused on encouraging the congregation to engage in the building of the Kingdom of God, and supporting the idea that we’re all “ministers of God”. A whole generation passed, and many of the Jesus movement are now senior citizens. During the past 40 years since, The generations of folks who grew up with Church as a norm have mostly died off, and with the rise of True Christianity emerging in the new churches, you observed a polarization of religion and society – As Jesus was preached more clearly (even if from many flawed individuals), people had to decide – will I follow or not. It wasn’t just a cultural thing, NOW it became again about what was Right – what was Truth. So, here’s my theory – due to a very fast acceleration of the polarity between darkness and light, the middle, those non-committed, half-hearted souls who only went for appearances, they’re gone. You’re either a strong Christian, or you’ve bailed on the church completely – why bother? So much fun to be had taking off the shackles of the churches “old ways” and living for today. Our millennial generation has had to pick between two MUCH greater extremes than we ever had to deal with when we were coming of age. SO, there’s been a winnowing – a sifting of God’s people. We have less attendance because for the most part, only TRUE believers are even bothering to come. I think you hit the nail on the head exactly. Excellent insight.